At the Bournemouth natural science society, a small fallow deer antler was just placed on a table , found by Steve Limburn. 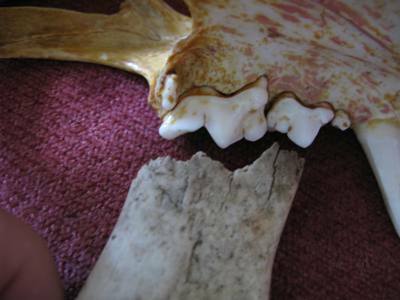 I noticed that it had all the hallmarks of being bitten by a large cat , most likely leopard so when i placed a genuine leopard skull and dentition next to it, it was clear to see that the trauma reflected by the carnassial teeth. Also the cat had tried biting lower down causing imprints but the antler was too hard to break at that point, so it then just managed to bite off the end.This antler was naturally cast so the cat would have to have just happened upon it and decided to eat it. This must happen in the same way as many other animals finding antlers and bones and deciding to eat them. antlers are full of calcium and other elements and vitamins which cats need especially growing or pregnant females.Often large cats eat some of the growing antlers on the deer kills they make, or the velvet surrounding antlers but it is unusual for a cat to find a dropped antler and eat it, or is it ? I am sure it must be more common and simply not found or documented. tooth pit analysis is an important scientific method of evaluating predator, prey relationships on prey species.I find these types of evidence far more real than photographs, something that most researchers dote on, yet as we see very little obvious evidence has arisen from trail cams, a way we all thought was the best way of achieving results and proving that large cats exist in the wild in Britain(or other countries). this has proved wrong and I think that researchers should adopt the more scientific approach if we are to convince a very sceptical public or scientific fraternity!.Fortunately at least one academic establishment have seen sense.The Royal agricultural college at cirencester has taken a leading role in tooth pit analysis, led by Dr Andrew Hemmings, some of his students have worked on this very interesting thesis and come up with amazing results. More later on this subject.